Fireworks celebrate the June 2012 arrival of Houston's full-size space shuttle mockup, which Space Center Houston's contest will now name. HOUSTON — Texans have a new freedom to celebrate this Independence Day: the opportunity to name a full-size model of a NASA space shuttle, which will become part of a major new Houston attraction in 2017. 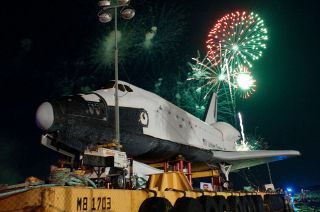 Beginning today (July 4) at 10 a.m. CDT (1500 GMT), residents from across the Lone Star State can go to the website NameTheShuttle.com to suggest names for the space shuttle orbiter mockup. Space Center Houston, the visitor center for NASA's Johnson Space Center, will pick one lucky Texan's entry for the christening of the 123-foot-long (37 meters) replica. Visitors to "The Shuttle and 747 Carrier" attractionwill be able to tour the insides of both the jetliner and the mock orbiter. The space shuttle, which is already equipped with a detailed crew compartment and payload bay from its 18 years on display at NASA's Kennedy Space Center Visitor Complex in Florida, will be upgraded to offer more access for guests and to better match its appearance to NASA's now retired fleet. The "Name the Shuttle" contest is seeking a name for the high-fidelity mockup that "symbolizes the spirit of Texas" and the state's "characteristics of independence, optimism and can-do attitude." The full-scale, high-fidelity space shuttle mockup formerly known as "Explorer" as seen at Space Center Houston. Entrants must be at least 18 years old and legal residents of Texas. The contest limits name suggestions to one per person per each day that the submissions are open. Duplicate entries will be credited to the first to suggest the name, based on the timestamp of the submission. The winning name for the shuttle, which will be chosen by a panel of judges, will be announced publicly by Sept. 10. The winner, in addition to having the honor of naming the shuttle mockup and being invited to attend the christening ceremony, will be rewarded with a three-day trip to Space Center Houston for up to four guests. The winner's prize package includes a VIP tour of Space Center Houston and a "behind-the-scenes experience" at Johnson Space Center, as well as accommodations and gift cards to cover fuel and food expenses. The winner will also receive a one year's supply of bread from Mrs Baird's Bakery. NASA named its space shuttles after sea vessels used in world exploration. The agency's space-flown orbiters were christened Columbia, Challenger, Discovery, Atlantis, and Endeavour. NASA's atmospheric test shuttle, Enterprise, was renamed from Constitution after fans of the TV show "Star Trek" staged a successful letter-writing campaign. For more information, the complete list of rules or to enter the "Name the Shuttle" contest, see nametheshuttle.com.